Bill Eidson has more than 25 years’ experience in marketing communications. An honors graduate of Boston University’s School of Public Communications, Bill was Corporate Advertising Project Manager for Digital Equipment Corporation. There, he managed the company’s $7 million recruitment advertising account, and the Healthcare, Value Added Reseller (VAR), and Education campaigns. He also managed The Discovery Lecture Series, a nationally broadcast satellite college lecture series in conjunction with PBS’ The Infinite Voyage. As Vice President at Cole & Company, Inc., a high-end video production and event management company, Bill worked on a wide variety of print and video projects for clients such as Nikon, Polaroid, Mattel and American Photo magazine. As the author of eight suspense novels, Bill applies his storytelling skills to his freelance writing assignments. Publishers include Henry Holt & Company, Saint Martin’s Press, and Justin Charles & Co. His latest book, THE MAYDAY, received a starred Kirkus Review, and, according to The Washington Post, “Eidson is a fine adventure writer, with the ability to shift among scenes, sketch in minor characters and create a pair of heroes whose vulnerabilities entice and intrigue us.” Bill’s books have been favorably reviewed in The Boston Globe, The Los Angeles Times, The Chicago Tribune, The Boston Herald, The Providence Journal, Entertainment Weekly and many others. Three of his books have been optioned for movies and translated for foreign rights. He has appeared on television, radio, and in numerous public speaking forums in the promotion of his books. For more information about Bill’s fiction click here for synopses, reviews, and short stories. When Bill is not writing, he spends his free time sailing with his wife and son. 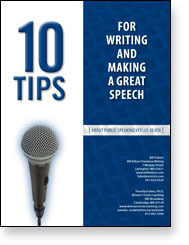 Contact me for a copy of my Free report "10 Tips for Writing and Making a Great Speech".